tickets. Another paid $45 and bought 12 tickets. How much will 22 tickets cost? 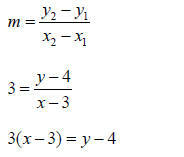 (x1, y1) = (3, 4) and (x2 , y2 ) = (x, y) . The equation in point- slope form is y − 4 = 3(x − 3) . point (x1 , y1 ) with a slope m is y − y1 = m(x − x1) . 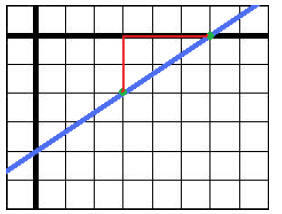 has a slope of 2.
and has a slope of -2.
the point (3, -2). 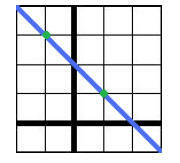 Find a second point on the line using the slope. 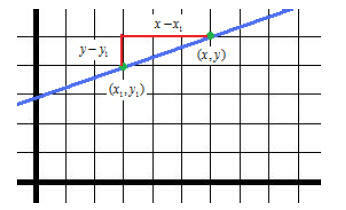 Ex 3) Write an equation in point-slope form of the line shown. Step 2: write the equation in point-slope form. You can use either given point. Check that the equations are equivalent by writing them in slope- intercept form . the cost of 9000 stickers. number of stickers (in thousands). that the cost is a function of the number of stickers.